Life with the Depews: Christmas, already!?! I am sooo not ready. Elfie still hasn't been located. The advent tree is empty. There has been no North Pole Breakfast. Not a single book is wrapped. And not a single Christmas decoration is out. And I found out today I have one week to make a moon costume for the school's Christmas play. As a complete fluke however we did run into Santa at the mall, got to sit in his lap and tell him EXACTLY what we wanted for Christmas and even got some pictures taken with him. 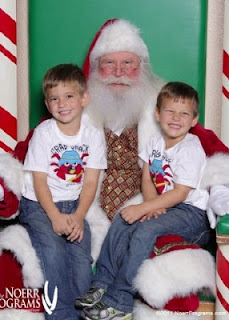 Wasn’t crowded at all – they let the boys sit and talk to Santa for probably almost 5 minutes. Took multiple pictures until I approved a good one and had a great Santa with a real beard. Gotta love small towns! Had to bribe the boys to sit and smile, though… I am pretty sure it wasn’t a fluke that they picked the corner right next to the cookie co for pictures. They also had an amazing ginger bread area that was all decked out with a GIANT gingerbread house (20 ft tall maybe?). Wish the boys as been more cooperative there – it would have been a great place for pictures. If I had thought to actually BRING my camera! Luckily Kevin & my mom had their cameras. They also had a train the kids could ride. Connor rang the bell for the entire 5 minute ride. He LOVED it. And some day when they are older we will have to let them skate at the ice rink.